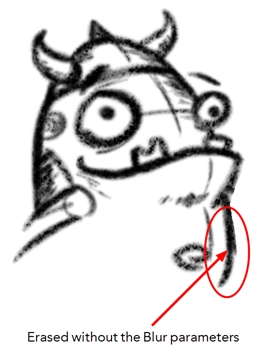 When you use the Eraser tool to erase a portion of a textured line, the vector frame is cut straight and you lose the feather created while drawing with the Brush tool. In Toon Boom Harmony, a special option in the Eraser tool lets you create a soft edge on your textured lines. You can also cut or keep the vector frame as is. 1. In the Tools toolbar, select the Eraser tool, press [Alt] + [E]. 2. In the Tool Properties view, select the Use Blur Parameters option. 3. While erasing, select the Keep Vectors option to keep your vector frames and not cut them. 4. Adjust Minimum Opacity and Maximum Opacity parameters of the eraser to change the transparency of the erasing trail as you press harder on the pen tablet. 5. Adjust the Hardness and Eraser Saturation parameters of the eraser to control the amount of smoothness and the size of the feather edge. 6. In the Camera or Drawing view, erase your textures lines. 7. In the Tool Properties view, click the arrow button. The Brush Properties panel opens. 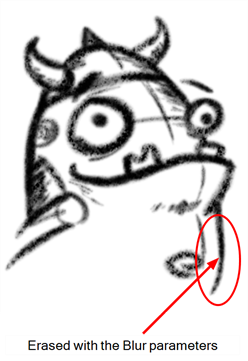 ‣ Tip Shape: Lets you select a shape for the tip of the eraser. There are a variety of tips to choose from: round, square, oval, star-shaped and more.